A 5-day training entitled “Hands-On Training on Harvesting in the Small Ruminant Value Chain in Ethiopia” was conducted to 23 meat inspection veterinarians and meat inspectors from different regions of Ethiopia, including Tigray, Borena, Oromia, Amhara, Dire Dawa and Addis Ababa. The training was conducted by our German partners and advisors from the Faculty of Veterinary Medicine, Freie Universitaet Berlin, in collaboration with the Ethiopian Ministry of Agriculture. The training started with a world café style discussion focused on the trainees’ experience in meat inspection. The discussion facilitated the identification of gaps in the implementation of key control measures in abattoirs in Ethiopia. Theoretical sessions covered topics such as diagnosis and prevention of transboundary as well as parasitic animal diseases relevant to the sheep and goat population in Ethiopia; technical procedures of ante-mortem and post-mortem inspection; and elements of hygiene. The training included two half-day practical sessions in abattoirs around the Debre Zeit area as well as a visit to local butcher shops. The training concluded with a short progress control. All trainees who successfully completed the training received a Certificate and a CD with the lecture presentations and several additional resources. 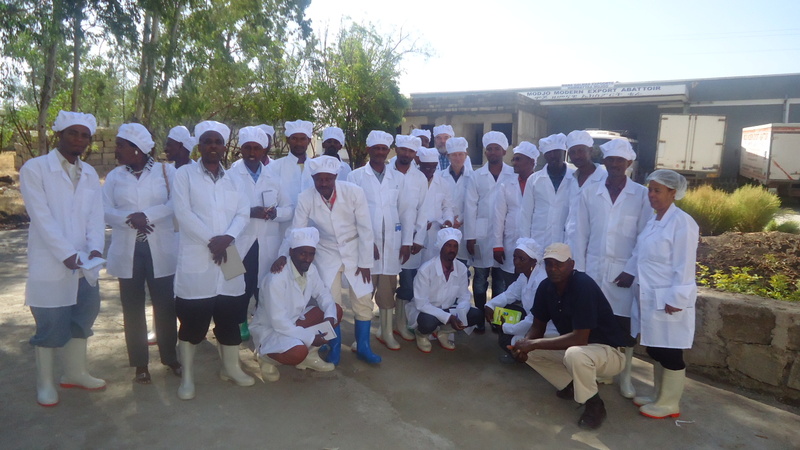 Tags: capacity strengthening, Ethiopia, food safety, slaughter hygiene, training, zoonotic diseases. Bookmark the permalink.